Personal experiences from the use of 3G mobile services with the Motorola A1000, which goes beyond a review, test and other news. A little more than a month has passed after I repaired and upgraded my A1000. I wanted the set to be in a nice condition, since I plan to sell it soon. The only real damage was the lost joypad button. The first fix, the store just put a new button in place, worked for less than a day. Then the button was gone again. In the 3 store (Stureplan, Stockholm) the customer service guy said the set had to be handled over to their repair shop. It would take about 24 hours. Well, it took three (3 :-) days. Then the button stayed for about four days until it popped off again. Actually, I find it easier to navigate without the button. The phone just does not look as nice when it is off. One bonus is that I got a new front shell - so the phone shines! At the time for the repair I asked them to upgrade the software if there was a new version out. Of course I first used the Motorola Desktop Suite (MDS) to make a backup. Took about five minutes to Bluetooth it over to my laptop in the store cafeteria. After the upgrade I was nervous when I restored the backup. First I made sure to select the same language in the phone as in the backup (English). Then I downloaded and installed the most recent version of MDS. The ringtunes, Phone skin and lock settings were lost (but the tunes was in the phone). I was a rather simple thing to redo the settings. Now Guru (positioning service) works with the in built GPS, pretty well actually. Tried many times before but never got it to work. All my installed applications (e.g. Tracker, Stacker) were automatically restored and worked just fine. The Tracker "Web shortcut" function does still not work. The same goes for my attempt to modify the default browser settings on the Home screen. Although the the icons I made are displayed, but the links are to 3:s portal, not where I want to go. All data (contacts, calendar, mp3-files, downloaded songs, etc) came back and the first sync with Outlooked went smoothly. Now the phone is as good as new. Well, maybe the battery is loosing its condition a little bit. I am not sure, but it seems that way. Yesterday 3 Sweden announced a new subscription that includes Skype. On the technical side that means two plans (1Gb or unlimited) data per month (bound for 18 months) and a "Skype kit". The latter includes a traditional phone number, software, headset with a mike and a sum to call for. It seems that you are not supposed to use Skype software in your phone, actually there are to my best knowledge no such 3G models available. Instead you connect through a 3G data card in your computer. My sincere apologies for the long time since my last posting. Been extremely busy with a number of projects, mainly concerning podcasting. A1000blog just had to be on hold. But now I am back - and from the train! A couple of postings ago I shared my thoughts about switching to a Qtek 9100. But after som deeper thoughts, research, discussions with users, and the juicy comment from "Kartamen" I have decided to stay with the A1000 (and 3 Sweden) for a while. The main reason is that Skype does not really work on the 9100, even though Skype has released beta versions for Mobile Windows 5 that in thery could run on slower PDA processors (see a post about that in The Unwired). I think I can survive without 3G, but only if WiFi/Skype is the trade-on. Furthermore, even though the camera is better on the 9100, it is not very good. Meanwhile I will send my A1000 for guarantee repair. I got a new joypad button in a 3 store, but it fell off after a few hours. And the second game button is not really working well. I will also change the subscription plan because I do not call enough to use up the 600 minutes in my current plan. Still, I am tempted to move because there are number of podcatchers (podcasting receiver) for Windows Mobile. 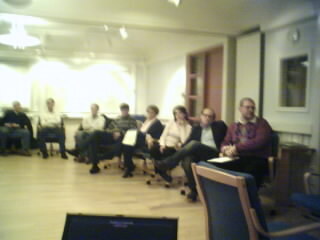 This demo of moblogging is presented for the managers taking the OPL program at IFL (www.ifl.se). In less than I month my one year subscription with 3 Sweden ends. In other words I am looking around for alternatives, including the mobile itself. I still want a touch screen pda model, but don´t feel that I need 3G. For the moment I feel inclined to get a Qtek S9100 (made by HTC and also sold under other brand names, like iJam). The S9100 is slightly thicker, but lighter than the A1000. But the best thing is that it uses a mini-SD card that can be replaced without turning oft the power. I also guess that Windows Mobile 5 is better when it comes to synching. Also, the camera seems better, but far from perfect for a mobile. Another great point is that the S9100 has built in WiFi and in theory can run Skype. 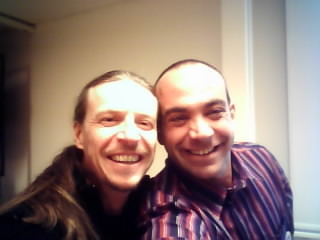 Last weekend when I met with Loïc (at the Swedish Bloggforum 3.0) he told us about Treonauts. If I got it right Andrew (who runs the venture) has made a big success with what started as a blog about a mobile phone/pda not even two years ago. Millions of visitors, a really good stream of advertising revenue and a full fledged (and profitable) Treo shop. All fuelled by Andrews passion for the Treo. I´m just using the A1000 - for the moment. I challenged Loïc Le Meur (Executive VP & Managing Director of Europe, Six Apart, the Company behind Lifeblog. 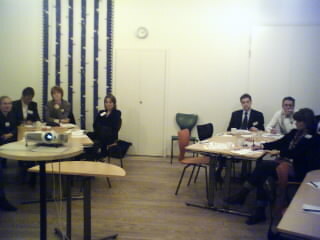 Today I meet with people mainly working in the FMCG business (sv. agligvaror). I am talking about blogging, podcasting & the branded life. Another early bird briefing. 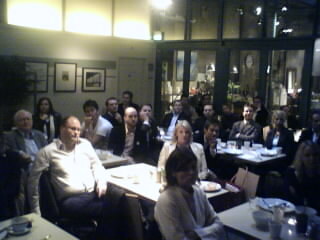 This brekfast seminar about blogging and podcasting is arranged by OMD (www.omd.se). Attending are their customers and partners. Nice people!